Hi everyone! Did you get a chance to hop along yesterday to see creations from the Candy Cane Lane Collection? I hope you enjoyed seeing the many ways to use the supplies in this collection. Today is the second day of hops. My hop day was yesterday and I shared 2 cards using goodies from the collection. Click HERE to view those cards. I have lots more to share though. 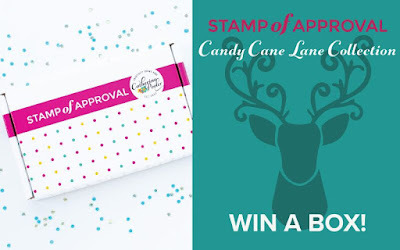 For this card I used the awesome Peppermint stick background stamp. I embossed using gold embossing powder. I then used the Merry Label die to create my focal point to stamp the amazing Stag stamp from the Hip Holiday stamp set. Look at his gold embossed, plaid chest and ears!!! So cool. I added the label die to the card using black fun foam for a bit of dimension. Make sure you hop along each blog and leave comments for your chance to win a box! Catherine is giving away a box a day, so you will want to leave comments. The more comments you leave, the more chances you have to win. Click HERE for Day 2 blog hop and HERE for Day 1! I am so in awe of your flawless embossing!!! I had one word to emboss yesterday and it took me 4 tries to get it right! The stag looks so majestic embossed in gold! You totally nailed the mix of elements on this card!!! This card is awesome. I love that gold background! Love that deer! Background makes it pop! Oh this is stunning Kristie!! Love the plaid gold embossing. Your background embossing is ridiculously fabulous!! This is pretty Kristie! It's gorgeous,Kristie! Wow on that background heat embossing! Ooh, love this! Such an elegant, classic look to it! 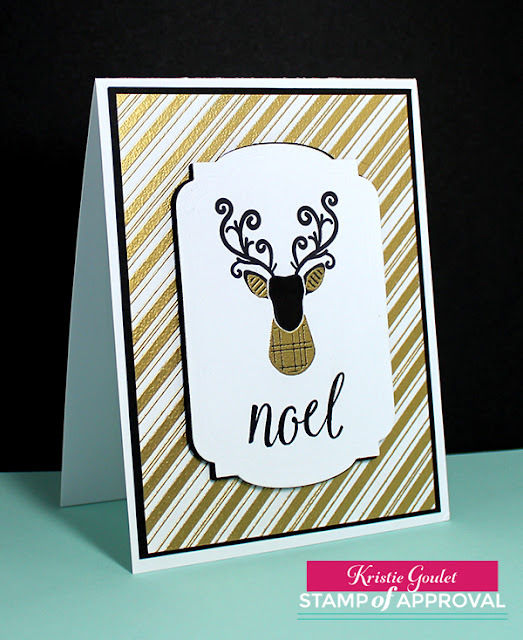 I love me some black, gold & white...very elegant card, indeed, Kristie! Awesome, elegant holiday card; great for males, too. Love the deer die.